Do you have your LiD Kit? Get it here to start and sustain your program. We urge you to also keep up to date with posts about LiD on imaginED–the official blog of the Centre For Imagination In Research, Culture, & Education at SFU. We invite you, if you have developed resources that others might use to aid their implementation of the program, to let us make them available to other LiD teachers through out networks! The LiDKiT is still available! 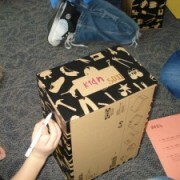 The LidKiT is housed in a large and attractive box, containing the resources that will enable any school or teacher to implement the LiD program. Producing the LiDKiT has involved us in large-scale revisions of many of the items we have until now made available on this page. Order one here. Currently we have only a few written accounts of the Planning phase, though there is, of course, a description in Kieran Egan’s LiD book. We have also recommended that during the initial ceremony when students are given their topics, they should also be given some ideas or questions that can start them off. Here are two approaches. In the first, the topics come with a set of three questions, and in the other they come with some interesting facts or ideas about the topic. 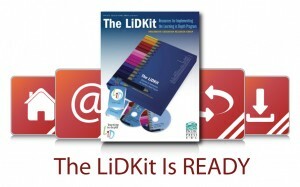 The new “LiDKit: Resources for Implementing the Learning in Depth Program”, includes first-person accounts from a number of teachers who have planned LiD programs and implemented them, including the following: Shannon Shields’s “Engaging curiosity,” an account from a K–9 school in Port Alice, British Columbia; Bob Dunton’s description of preparations and early implementation in Corbett School in Oregon, USA, in multi-aged classrooms (K-3, 1-3, K-2); David Futter’s account of implementing LiD with grade 8 students in Victoria, British Columbia, and more. You might find this video welcome to the LiD program by Kieran Egan of use when you begin the program, even as part of the ceremony starting it off. The video takes only about 2 minutes, and is addressed to the students. While LiD is a relatively straightforward program to introduce into educational contexts, it, like any innovation, will be most successfully implemented and sustained if certain steps and proven practices are thoughtfully followed. The material in this guide is intended to support you in successfully implementing the LiD program whether you are a teacher, an administrator, parent or online educator. Linda Holmes’s description of the first year in Langley, B.C. with a multi-age class, along with pictures and various documents she prepared. Ms. Holmes, in her pioneering program took on the challenge of implementing LiD after hearing it discussed quite briefly, and before any of the resources that have now been developed were available. “Some operating principles”. This document offers advice about how to engage students’ imaginations in their topics, and how to keep accommodate support for the students as they get older and change the nature of their interest in their topics. “Building the portfolio.” A discussion of the practical steps to help the student build the portfolio, and advice about the form and development of portfolios. If you want to encourage your students to enlarge their LiD work in scope or variety, or if they ask for some new ideas, you might try Linda Holmes’s 39 “Tip of the Week” suggestions valuable. Check them out–with thanks to Linda for continuing practical supports for the program. Teachers working with secondary students working on their LiD projects sometimes would like resources that can focus on some aspect of a student’s portfolio work that might need some help. The incomparable Kelly Robinson has been producing lots of such resources, and we are delighted that she is letting us use them here. Click below to see a set of these that can enrich students’ work, help them with their research, give them ideas for presentations, and other useful material. This handout is to help students clarify what aspects of their topic they want to pursue and maybe hone in on new areas. It will also help them move from a general topic to precise questions to pursue. This handout will help students look for the people behind their topic, or the people who animate it in some way, to drive towards a deeper understanding of the topic. This handout is a set of questions that will help students reflect on their research. This handout is a framework they can use to log their research work and record sources of information. This is a handout to help students explore various dimensions of their topics by learning to ask a variety of different kinds of questions. This handout helps students think about their topics in narrative terms, which can be useful in stimulating more engagement with the topic and also for preparing descriptions and presentations of the topic to others. This is a rather lengthy discussion of the pros and cons of the LiD program. Or at least it is an attempt to waylay a number of concerns about the applicability of the program, and respond to what are the commonest objections people have made or that we can imagine.